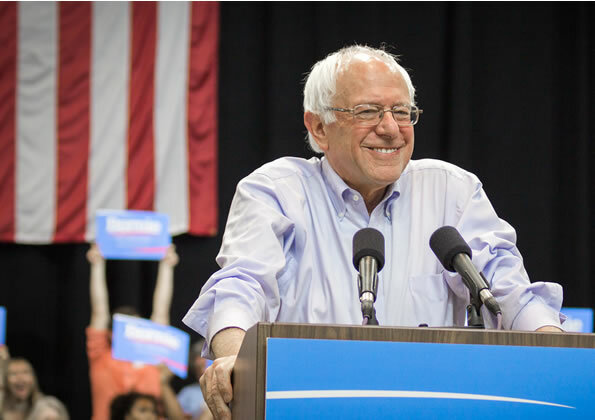 If Senator Bernie Sanders wins the Democratic nomination and is elected as the President of the United States, he will be the first Jewish President in the nation’s history. Although Sanders does not describe himself as particularly religious, his roots are in Judaism with a deep family history in Poland. As with many Jewish families who immigrated to the United States in the age of the Holocaust, their Jewish faith is deeply intertwined with this difficult history. Sanders’ father, Eli Sanders, left Slopnice, Poland in 1921 and came to the United States. During the Nazi occupation of Poland, Slopnice was a central location for Nazi activities and most of the Sanders family died in concentration camps. Eli Sanders’ wife, Dorothy Glassberg, was a native of New York City and is also a descendent of Jewish parents from Poland and Russia. Post-Holocaust Brooklyn, New York, was a community with strong Jewish roots and neighborhoods filled with the relatives of Holocaust survivors. A sense of social consciousness and survival dominated the neighborhoods of Brooklyn with a tough – yet progressive – political environment. Young Bernie and his older brother, Larry, were raised with modest means on a paint salesman’s salary in Brooklyn where they attended Hebrew school and had traditional bar mitzvah ceremonies. They studied the Torah, learned about the prophets and learned about Jewish history. Bernie Sanders thrived during his time in the Brooklyn school system where he ran track and served as the student-body president. Following the receipt of his political science degree at the University of Chicago in 1964, Sanders, his brother and his first wife, Deborah Shiling, traveled to Israel. The Sanders brothers were drawn to life in a kibbutz, with Bernie staying for six months and Larry staying for three years. This exposure to a quiet, rural life and spending time in nature is what drew Bernie Sanders to the state of Vermont, where his interest in politics and social change grew. Sanders is very protective of his private life, but with his marriage to Jane O’Meara – a Catholic – in 1988, one might assume that he was no longer actively practicing Judaism at this point in his life. Sanders has been described as a secular Jew who doesn’t practice religion; he does not regularly attend any synagogue, and he works on Jewish holidays. At the same time, during his term as the mayor of Burlington, Vermont, he had a menorah placed at city hall and performed the Hanukkah ritual of blessing the candles. His Jewish identity has been described as more cultural than religious. In 2013, the two Sanders brothers and their wives traveled to their homeland of Slopnice, Poland to explore the Jewish roots and Nazi war history of their father’s former home. Although Sanders does not claim to be strongly religious, the consensus is that his family history and participation in Judaism shows clear parallels to his political platform.